According to legend, the Aztecs were told by a god to find a place where an eagle stood upon a cactus with a snake in its beak, and there, to build their city Tenochtitlan, the Aztec capital that was to become epicenter of power for the powerful Aztec Empire. In 1978, some electricity workers unearthed an 8-tonne stone disc of Coyolxauqui (“Koh-yowl-SHAU-kee”), an Aztec goddess. Further exploration revealed that there was an entire archaeological wonder lying beneath Mexico City’s streets, and a decision was taken to demolish some old colonial buildings, to reveal the Templo Mayor (Main Temple) and the place where it is believed the Aztecs saw the sign given to them by their gods. Today, it is still Mexico’s national symbol: an eagle perched on a cactus devouring a snake. It was nine years hence, in 1987, that the museum was officially opened, but people have been visiting the site, even during the digging stages, albeit in limited numbers and in restricted areas. The Templo Mayor is today a major attraction in the very heart of downtown Mexico City and is one of Mexico’s most important archaeological sites. If you’re in Mexico City, the Templo Mayor should be high on your list of places to explore and experience. The Museo del Templo Mayor has a stunning collection of Aztec artifacts— the best you’ll find anywhere—and they were all dug up from the ruins around the Templo Mayor. The Templo Mayor itself is an impressive piece of archaeology. The Temple and other structures you see here were some of the first sights Hernan Cortes and his Spanish travelers saw when they arrived at Tenochtitlan nearly 500 years ago. You may find it more beneficial to visit the covered museum inside the archaeological site before wandering around the ruins, to get a better idea of what the area looked like, as there is a detailed scale model of the old city inside the museum. The covered museum is at the end of the “tour” inside the site, so if you want to do this, make sure you start walking from the “exit”; the museum will be across a small walkway on your right. By Air: The closest airport to Templo Mayor is Mexico City. For detailed information about flights and flying, see the Mexperience guide to Air Travel in Mexico. 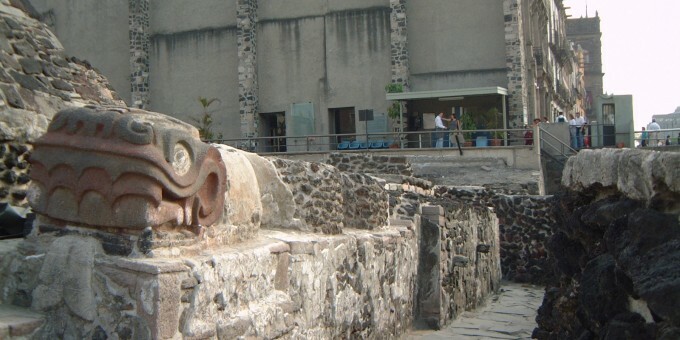 By Car: Templo Mayor is situated in the heart of Mexico City. We recommend that you do not drive here; traffic congestion is severe and parking is difficult and expensive. The best way to get to Templo Mayor is via the Mexico City metro system. Connect to the Blue Line and alight the train at “Zocalo”. Head to the northeast corner of the capital’s principal plaza to find the entrance to Templo Mayor. See Also: Our guide to the Mexico City Metro system. By Taxi: If you are adverse to using the metro system, any taxi driver will take you to the downtown area. Ask for “El Zocalo“; riding a taxi may take longer than the metro due to traffic congestion, but you won’t have the hassle with parking and parking charges. See also Traveling by Taxi in Mexico. Getting to Mexico City: For full information about getting to and around Mexico City, see the Guide to Mexico City on Mexperience. Opening Days & Times: Tuesday-Sunday 9 am to 5 pm. Modest admission charges apply and there are concessions for students, children and seniors. On Sundays, admission is free for Mexican citizens and foreign residents (with proof of residency). Ideal Clothing & Footwear: Wear comfortable walking/hiking shoes with a non-slip sole. Climate is temperate year-round but Mexico City can get hot in the summer months— take sun screen and a hat. The local climate is the same as that for Mexico City – Temperate all year round; can get hotter in the summer months; cooler in the winter, especially mornings and evenings. The rainy season is May-October; drenching rains tend to arrive in the afternoon and last for a 2-3 hours. If you will be exploring Templo Mayor, take sun screen and a hat as even in Mexico City it can get quite hot, especially during the spring and summer months.